At 771 pages, The Goldfinch by Donna Tartt is in many ways a magnum opus. It is also a massive treasure trove for writers. Let’s delve in and see what we discover. Summary: Thirteen-year-old Theo Decker survives the blast that kills his mother. Because his father has disappeared, he is taken in by a friend’s family. Struggling with his grief and the changes that have occurred, the teenager clings to a small painting that reminds him of his mother. As he finds his way to adulthood over the next ten years, the artwork becomes both a comfort and a curse. 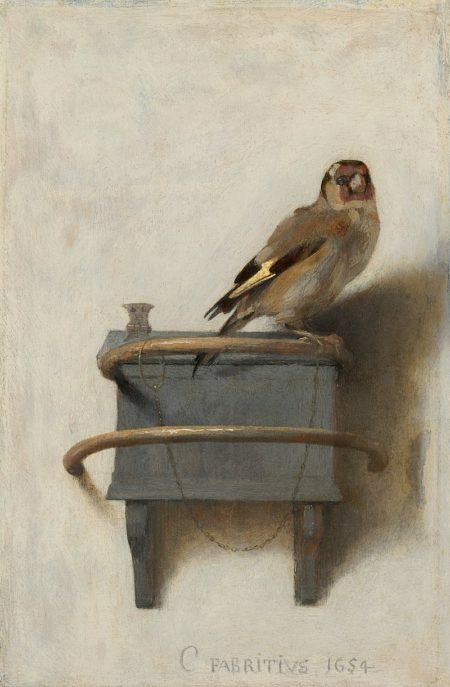 The Goldfinch took Donna Tartt a decade to write. It won the Pulitzer Prize in 2013. As literary fiction, this novel checks all the boxes. It is more character driven than plot driven and devotes a great deal of time to the main character’s inner life, including pages of discussions of Theo’s mental anguish. That said, the novel does have a well-developed — if sometimes meandering — plot to keep the reader engaged. Throughout, the mystery of the painting lies at the central backbone of the book. As expected in this type of fiction, the writing is lush and polished. Every word feels like it has been carefully chosen and then coddled, until it has grown into a perfect sentence. The vocabulary is also superbly elevated. For example, the word “inwrought” in the first sentence isn’t in spellcheck. Tartt’s word choice allows the nerdiest of us to flaunt our lexicons. Literary fiction is defined by its revelations about the human condition, and this novel has more than its share. In the last section, profound wisdom is unsheathed, with page after page of quote-worthy insights. That life – whatever else it is – is short. That fate is cruel but maybe not random. That Nature (meaning Death) always wins but that doesn’t mean we have to bow and grovel to it. That maybe even if we’re not always so glad to be here, it’s our task to immerse ourselves anyway: wade straight through it, right through the cesspool, while keeping eyes and hearts open. And in the midst of our dying, as we rise from the organic and sink back ignominiously into the organic, it is a glory and a privilege to love what Death doesn’t touch. Donna Tartt’s musings about art are especially enthralling. —if a painting really works down in your heart and changes the way you see, and think, and feel, you don’t think, ‘oh, I love this picture because it’s universal.’ ‘I love this painting because it speaks to all mankind.’ That’s not the reason anyone loves a piece of art. It’s a secret whisper from an alleyway. Psst, you. Hey kid. Yes you. None of the characters in this novel are simple. We learn on the very first page that the main character, Theo, is an unreliable narrator, yet we are drawn to him. He wanders through life, propelled by his friend and sidekick, Boris, an alcoholic who boldly walks on the wild side, and yet tries to protect and take care of Theo like he’s a lost puppy. Theo’s mentor and father-figure, Hobie, seems to be honest and upright, yet he remains loyal and loving regardless of how Theo tests him with dishonesty. Each character surprises us. Donna Tartt’s descriptions are masterful and fully integrated. They never take the reader out of the story. Theo grows up in New York City and spends most of his life there. The descriptions of New York are richly drawn and visceral, from the cold, damp weather to the odor inside a taxi. Along Park Avenue, ranks of red tulips stood at attention as we sped by. When Theo’s father takes him to Las Vegas, we sense the glare and heat. With strip malls arising out of blocks of stucco homes, the author captures a feeling of emptiness and disconnection. Most of Theo’s time in Amsterdam is spent huddled in his hotel room, but he does encounter canals, bridges, cobblestones, and bicycles, giving us a flavor of the place. As would be expected from a prominent work of literary fiction, the reader could spend a lifetime investigating the themes and symbols in this book. The main themes include the value of art, what defines a family, and what is love. The fact Theo was thrown into taking care of himself at an early age explores a theme of premature adulthood. Spirituality comes into play, too. According to an interview, Donna Tartt’s goal for writing a novel is to give her reader the opportunity to get lost in a book. If that is true, she has more than succeeded. To me, reading the first half was like gliding a knife through soft butter. It was so smooth that it was effortless. I looked up and a hundred pages had flown by. As Theo’s mental stability wavers in the middle, however, so does the readability. I found the section in the hotel room in Amsterdam to be particularly difficult. By then, I was committed to find out what happened to him, so I plowed through to the end. It helped to realize the author’s jumbled writing reflected Theo’s delirium and mixed-up thoughts. Part of why the story is so compelling is because Donna Tartt is a magician at setting up “little mysteries” through foreshadowing. For example, Theo goes to meet his fiancee Kitsey and she is “held up.” Her brother Platt awkwardly makes an explanation. Theo is confused, but doesn’t seem too concerned. The reader wonders what that was all about. A short time later all is revealed when we learn Kitsey is in love with, and secretly meeting, an old friend/enemy named Tom. Of the Pulitzer Prize winners we have read so far, this one is the first that I truly enjoyed and the first where I didn’t have to figure out why it deserved the award. This is a truly magnificent novel. Have you read The Goldfinch by Donna Tartt? We’d love to hear your thoughts.